Visiting the American South by RV always delivers the unexpected. Whether you’re chasing warmer temps in winter or a balmy lakeshore in July, there’s a southern RV adventure with your name on it. To whet your appetite for sweet tea and southern RV comfort, we’ve chosen three special places that welcome campers with the attractions, amenities and authentic southern charm. Travel south on I-85 from Atlanta, Georgia, and you’ll find a place where farmer’s markets offer abundance year-round, waterfalls splash into crystal clear pools and Auburn Tigers football reigns supreme. Even more enticing are the options for RV camping in this eastern Alabama playground. From a cozy, farmstead campground beneath the trees to a large, first-class resort with every amenity an RV camper could want, there’s a place for every style camper in Auburn. You’ll also have the chance to visit one of the prettiest state parks in the South. Just a short drive from Auburn, Chewacla State Park offers a full-service campground, picturesque swimming beach and a rocky waterfall worth the hike to discover. While in the town of Auburn, be sure to visit the many farmer’s markets for a taste of natural Alabama. RV travelers also list the vintage town of Opelika as a must-see attraction while in the Auburn area. And don’t miss the live music venues that keep the nighttime sizzling downtown in both Auburn and Opelika. Give yourself the gift of visiting the Auburn area by RV. Here’s a link to Alabama RV campgrounds to assist your planning. RVers who travel the South frequently are familiar with a vibrant town on the Mississippi coast where historic sites, casinos and Gulf Coast outdoor recreation deliver the best in vacation fun. Bay St. Louis is surrounded by scenic blueways where you can paddle through the bayous and along the Pascagoula River. Nature trails dot the landscape on public lands preserved for future generations. The coastal plain makes a fascinating classroom, filled with plant life, animals and birds in stunning varieties. Local outfitters can plan a tour by land or water that will suit the interests of your entire group. Prefer to spend your days in town? In Old Town Bay St. Louis, you’ll find the perfect place to enjoy a jazz brunch, to purchase unique gifts made by local artisans and to soak up the charm and culture of the Mississippi Gulf Coast. There’s even a self-guided walking or biking tour that celebrates the town that’s stood the test of three centuries. We can’t discuss the attractions of the Gulfport-Biloxi area without mentioning casinos, two, in fact right in city of Bay St. Louis. Casinos don’t just mean gambling, either; they feature world class entertainment, upscale shops and luxury spa services, as well. 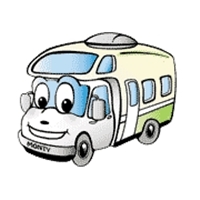 Check with your campground hosts about the local shuttles that ferry gaming enthusiasts to area casino action. Speaking of campgrounds, when it’s time to set up camp in Bay St. Louis, you won’t be disappointed. There are hundreds of campsites within easy driving distance of Bay St. Louis attractions, in the city itself as well as in surrounding towns like Gulfport, Pass Christian and Kiln. Use this handy list of Mississippi RV campgrounds, and be sure to make reservations…this region is famous with RV campers. If a tiny mountain town surrounded by national forest sounds like the ideal place to go RV camping in the South, it’s high time you came to Blairsville, Georgia. An hour and a half north of Atlanta in the Blue Ridge Mountains, this alpine hamlet is the hub for a wide variety of outdoor recreation. Camp in nearby Vogel State Park in Chattahoochee National Forest, and then find the trails that lead past mountain peaks, quiet hollows and hidden lakes rich with wildlife. Be sure to experience the views from Brasstown Bald, the highest point in Georgia. Keep your eyes open for waterfalls along the way, as well. When you’re ready for a bit more civilization, take a trip into the towns of Blairsville and Suches, where year-round festivals add even more flavor to your Blue Ridge Mountain experience. One more note for paddling enthusiasts—three lakes in surrounding Union County give plenty of blue water possibilities. RV camping in the South is a different experience everywhere you stop and every time you come. If you’re looking for authentic Southern RV comfort and charm, you can’t go wrong by choosing one of these three destinations. And, because we’re here to help, be sure to let us know if an RV rental will help make the trip your reality. If your family loves to get underground and explore, two caves in northeast Alabama should be your next RV camping destination. Only fifty miles apart, Russell Cave National Monument and Cathedral Caverns State Park will teach the kids about ancient civilizations and also thrill them with first-class natural wonders. Use our handy guide to camping and caving to plan your trip. Russell Cave National Monument, in Bridgeport, Alabama, is a 45-minute drive from Chattanooga, TN on I-24W. It’s also only 2 hours south of Nashville on I-24E. Once you’ve explored to your heart’s content at this cave, head one hour south to Grant, Alabama on AL-2 and US-72 to find Cathedral Caverns. The attraction at Russell Cave is history! North America’s earliest inhabitants left clues to their cultures in this large shelter in the rocky face of Montague Mountain. The visitor center and museum houses excellent exhibits of the prehistoric artifacts archaeologists have unearthed on-site. The cave tour itself is restricted to the shelter just inside the cavern’s entrance, but it’s an easy hike and well worth the trip. Take the time to take the cavern tour, check out the exhibits and videos at the museum and have a picnic on the park grounds. Teach the youngsters even more about nature with a hike along the North Alabama Birding Trail and a stroll through the park’s Wildflower Meadow. If the kids haven’t entered the National Park Service Junior Ranger Program at another national park, this would be a great place to start. When you head south to Cathedral Caverns State Park, get ready to experience a wonderland of giant rock formations. From the enormous cavern entrance to record breaking collections of stalactites, stalagmites and other structures formed over the eons, there’s plenty to see and enjoy throughout the cave. Cave tours run seven days a week, every two hours beginning at 10 a.m. Young ones may also want to try their luck at finding gems in the ‘mining’ area and hiking the trails throughout the park’s picturesque setting. There’s nothing quite like coming home to RV comfort after an exciting day of exploring underground! If you arrive early in the day at Cathedral Caverns, you may be able to snag one of the first-come, first-served water and electric campsites at the park. There are also several campgrounds within easy driving distance—Lake Guntersville State Park, just thirty minutes away, has a large RV campground and reasonable rates. You’ll find more information here about Alabama RV campgrounds. Did you know that the rugged mountains and hollows of Alabama have more caves per mile than just about anywhere in the US? It’s true, and that’s why we wanted to give you more ideas for extending your Alabama camping and caving adventure. If you’re camping at Lake Guntersville, take the Cave Trail to find a cozy little cavern along the way. For families on an extended trip, head south two hours to DeSoto Caverns Family Fun Park for a day of adventure and a night of full-service RV camping on the grounds. Rickwood Caverns State Park near Birmingham also offers a small on-site campground and a cave tour that takes you and the youngsters seventeen stories below ground! A trip to visit the caves of northeast Alabama means family fun time in exciting natural settings. Camping in an RV means comfort, safety and convenience while you’re there. Start planning this year’s caving and camping trip now and don’t forget to post your memories here in our comments section! At this time of year the weather seems to like to play a few tricks on us. It can make you think it is almost springtime. However, winter is still upon us. Right now is the perfect time for going on a winter RV getaway to beautiful Alabama and Talladega National Forest. You will miss the cold winds blowing and you won’t have to shovel snow off the sidewalks. You are headed into the real South! Talladega National Forest is a place of such beauty, deep in the South’s heartland with mountain terrain and wilderness landscapes. Outdoor activities are abundant with recreation for the whole family. RV camping can be found at Cane9Creek RV Park and Campground in Heflin. This RV camping spot offers all the amenities you need and makes for easy access to the forest and surrounding attractions. The first thing to do is drive the Talladega Scenic Byway where you can enjoy some spectacular scenery and get your bearings as you arrive in this huge forested paradise. From this drive you can get to your next stops in Talladega National Forest, including, of course, the highest mountain in Alabama. You are going to love visiting Mt. Cheaha with an elevation of 2407 feet, making it Alabama’s highest point. Go right to Bunker Tower which gives the best views of the forests and Cheaha State Park below. There is an observation room at the top of this amazing stone tower which you get to by climbing an interior staircase. In the Talladega Ranger District you’ll discover Lake Chinnabee Recreation Area, with a lovely lake and plenty of picnicking, fishing and hiking. Here you can take to the Chinnabee Silent Trail and hike. It is twelve miles round-trip from the recreation area to the top of Talladega Mountain and back. There is also a nearby trail for mountain bikes, ATVs and motorcycles – Kentuck ORV Trail. The Coleman Lake Recreation Area is a quiet and peaceful place tucked into the Talladega Mountains and providing plenty of outdoor fun for visitors. You’ll find camping here too, and a 21-acre lake. Hike the famous Pinhoti Trail as it winds through this area. Another recreation area within this national forest is the Payne Lake Recreation Area. There is an even larger lake here where you can boat or fish. Cheaha State Park is a place where more recreation opportunities await. The most popular attractions in this section of Talladega are the fabulous waterfalls. You can reach Cheaha Falls, Devil’s Den or High Falls by taking some short hikes. The park also boasts Depression-era stone structures which are a little bit of history for you. More history of a little different kind is waiting to be discovered at the Overlook at Bald Rock. During the Depression, the Civilian Conservation Corps wanted to develop this area so visitors could benefit from the spectacular views. Doug Ghee Accessible Trail was created and is a wonderfully smooth boardwalk, an easy trail that leads to the observation platform. You will want to stop here before heading home. It will be a fitting end to a most exciting RV winter vacation. Celebrate that historic time in our country’s past when voting rights demonstrations and the Selma to Montgomery March became news around the world. The Selma to Montgomery March Byway offers an RV excursion that is hard to beat in reliving a vital time in America’s history. You can follow the route of Dr. Martin Luther King, Jr. as he led the way on the Road to Freedom. Beginning on the 7th of March 1965 in Selma, Alabama, the Selma to Montgomery March wound its way through Selma, marking the start of something big for America. As you follow this trail all the way to Montgomery, you will visit key spots along the way. The route is 54 miles long and, depending on how often you stop, can take from one hour to a full day. RV campgrounds can be found near Selma and in Montgomery. One great park is the Montgomery South RV Park with large pull-through spaces. Your visit should start with the First Baptist Church where Dr. King spoke often to others of the Civil Rights Movement. He also would gather youth together here to enlighten them on the struggle. Then you can stop at the Brown Chapel, another major attraction on the byway. This church also housed many civil rights activities in the county. This is the location where the march actually began. Cecil B. Jackson Public Safety Building was the City Hall in old Selma and held the jail where King and other protestors were imprisoned for their protests. You can stop here and visit and get the feeling of the vital spirit of those days. While others were still in jail, marchers would file past and sing loudly to give them hope. The scene of Bloody Sunday was located at the Edmund Pettus Bridge. On March 7th, as the marchers moved across this bridge, they were stopped and driven back by troopers and sheriff deputies as well as a posse on horseback. The unarmed marchers were attacked – beaten and gassed – which shocked the nation. The bridge became a symbol of all the changes taking place in America and communities around the world. On one shore you can go to a park which commemorates the site of Bloody Sunday. Further along you will find the National Voting Rights Museum and Institute. This museum will give you a full overview on the struggle for equal voting rights, with first-hand stories about this historic march. As you travel on the route taken by the marchers, you will see a number of campsites where they spent the night. Be sure to stop when you see one to get more of the history of the times. The City of St. Jude was one major campsite of the marchers on March 24th. The site of their camp was the athletic field and marked the last night on the march to the capital. Many celebrity singers came to celebrate, including Tony Bennett, Harry Belafonte, Peter, Paul and Mary and Sammy Davis Jr. The end of your trip will be in Montgomery, Alabama, the same ending for the marchers on this particular quest for freedom. Visit the Alabama State Capitol where King delivered one of his most famous speeches. Your RV trip is over, but the memories made from this journey will never be forgotten. Photo credits: The picture of Brown Chapel is copyright © 1996 Selma to Montgomery March Byway. It is used here in accordance with their terms and conditions. The picture of the Edmund Pettus Bridge is copyright © 2001 Selma to Montgomery March Byway. It is also used here in accordance with their terms and conditions. Birmingham, Alabama is in the very heart of the South, a lovely city in Jones Valley. This metropolitan area became the focus of national and even international attention when the civil rights struggle for African-Americans began. Now you can experience the feel of days gone by, as well as take part in great family activities when you come here on an RV getaway. There are spots for RV camping near Birmingham where you can settle in before beginning your adventures. A must-see, of course, is the Birmingham Civil Rights Institute where the special events and numerous children’s activities make it a great place to go. This museum expresses the truth of the civil rights movement in a way that is healing and educational. Every American should visit this facility which memorializes our civil rights history. Getting outdoors and soaking up the sun is an important part of a visit to Birmingham. Be sure to stop at Birmingham Botanical Gardens and stroll through acres of unique gardens and original sculptures. There is free admission! Look up all those hard-to-find facts about your garden at home in the largest horticultural library in the United States. See the traditional tea house in the Japanese Gardens. If anyone in your family is a science buff, the McWane Science Center is a must to put on your itinerary. Even if you aren’t a true fan of science, you will be by the time you finish touring here. There are numerous interactive exhibits as well as an aquarium, playgrounds for the kids and dinosaur fossils to examine. Don’t neglect to see a film at the IMAX theater. At Birmingham Museum of Art you will discover one of the finest collections of art around. See a diverse representation from many different cultures, including African, Asian, American, European and Native American. For a change of pace, make your way to the Vulcan Park and Museum. This is the home of the world’s largest cast iron statue and Italian artist Giuseppe Moretti created it from local iron way back in 1904. For an animal encounter, nothing can beat the Birmingham Zoo! See the sea lions put on a famous show, explore the Trails of Africa to see giraffes, zebras and bull elephants. Do you love those crazy ole rhinos? Experience their antics at the Rhino Encounter. Young and old love to visit the zoo, and the animals will love it if you do! Tour downtown to make some lasting memories of your trip to Birmingham. Buy some hot peanuts, just like residents did over 100 years ago on these very streets. You will visit sites on your walking tour that hold a place in the hearts of all those who fought for civil rights. The next place to go is the Alabama Jazz Hall of Fame. More history of a different kind awaits you here. Learn more about Duke Ellington and Nat King Cole. Find out how boogie woogie began. Before heading home, stop in Railroad Park and celebrate your visit to this city by attending one of the great events or concerts happening here. When you leave Birmingham, you know you will have enjoyed the best of what this southern city has to offer. As you move through the lush countryside of Alabama on your RV vacation, you may not realize that the opportunity to explore the wonders of space is nearby. In Huntsville, AL you will find amazing museums and centers that give you just that chance. Of course, there are many more things to do in this great Alabama city, so it is an ideal spot to put on your itinerary. You won’t find any lack of amenities in Huntsville. You can arrive, get settled and get busy with your adventure. First stop is the U.S. Space & Rocket Center, one of the most comprehensive museums covering manned space flight around. You can see the restored Saturn V from the Apollo era at the Davidson Center for Space Exploration. Learn about the Space Shuttle program, trace the evolution of our ventures into space. This is an incredible experience you can’t pass up. If you make a little effort, you can get a bus tour of the Marshall Space Flight Center. This center is not one where the general public can come, but if you apply for a bus tour you will be able to see the Historic Redstone Test Stand where rocket engines were tested and the Payload Operations Center where activities on the Space Station are coordinated. To get on the bus, you will need picture ID, have no outstanding warrants, and not carry large bags with you. Next door to the Space and Rocket Center you can change your view as you shift over to Earth’s natural wonders. Huntsville Botanical Garden is a lovely and inspiring place of natural beauty. You can see thousands of butterflies, many little turtles, frogs and many other critters that make their home here. You will thrill to the Garden Railway, a popular miniature display with a European village, ponds, waterfall and forests. Also be sure to enjoy the Washio Ishii Bonsai Display. Now it is time for some history. The complex of EarlyWorks Museums will fulfill your quest for historical moments. The EarlyWorks Children’s Museum is perfect when you have the kids with you. There is not a child who doesn’t have a ball when coming here. At the Historic Huntsville Depot you will learn all about life on the rails in the mid-1800s. Alabama Constitution Village holds fascination for all ages. Experience the village where the daily tasks proceed just as they did two centuries ago. A stop at the Sci-Quest Science Center offers many hands-on displays and exhibits that make learning fun. Located on Wynn Drive, you need to make it a point to get over there with the young ones. When you need a little air and want to stretch those travel-weary muscles, go to Blevins Gap Preserve for some hiking. There are numerous trails where you can get in some time in Alabama forests and lush landscapes. Or take off over to Ditto Landing for some fishing or boating. You’ll find RV camping at Ditto Landing Recreational Complex & Marina. Central Alabama is a favorite destination among RV campers, with plenty of reason. The old growth pine forests and rocky hillsides just south of Birmingham inspire campers to park the RV and explore. One great place to do just that is Oak Mountain State Park. Here are just five of the reasons RV campers have come to treasure this Alabama outdoor playground. Year-round RV camping tops the list of reasons why motorhome campers love Oak Mountain State Park. The mild winter temperatures annually draw thousands of RV camping enthusiasts to the large, pine-forested campground at this state park. Reserve improved campsites here and then make plans to enjoy your stay in any season. Park your RV at the campground and then lace up those hiking boots; there’s a discovery waiting to inspire you on the trails. Although this park is just a short drive from the city, its nine thousand acres of forests, streams and lakes yield wonderful hiking opportunities. Fifty-plus miles of trails, from steep and rocky to smoothly sloping, allow hikers of every age to enjoy the pine forests, rocky ridges and scenic waterfalls within the state park’s boundaries. RVers who are also avid mountain bikers will appreciate the Double Oak Trail, a twenty-mile-plus combination of double and single track challenges through diverse trail conditions. Bring your mountain biking gear and plan to take the challenge when you camp at Alabama’s Oak Mountain State Park. This trail and several others will furnish plenty of adrenaline-spiking action on your vacation. The Alabama Wildlife Rehabilitation Center is another fascinating reason RVers enjoy a stay at Oak Mountain State Park. With more than a thousand sick and injured birds treated and released annually, there’s always something to learn when you visit the center. Come see why this privately operated animal rehab center is so important to the species who call the state park home. And what’s a trip to Alabama without fishing? Two small lakes make up the Oak Mountain Fishing Center and promise lively competition with bream, bass and crappie. Bring or rent a john boat or fish from the bank; a day on the water will add fond vacation memories of Alabama. These are just five of the ways Alabama RV campers can enjoy the attractions at Oak Mountain State Park. If you’re looking for back to nature fun, the tree-lined hills and stone-studded valleys of this central Alabama state park are sure to deliver.